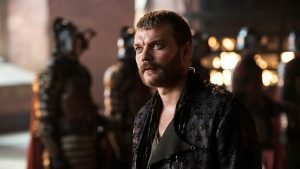 After last week’sÂ Game of ThronesÂ episode closing on Euron’s sneak attack that wiped out a big portion of Daenerys’s fleet, “The Queen’s Justice” is going to be about the fallout. Cersei will certainly be pleased, maybe receiving her â€œgiftâ€ of Ellaria Sand, who Cersei has a personal vendetta against for killing Myrcella. And we can also expect Euron to receive a warm heroâ€™s welcome back in King’s Landing. But make no mistake, Daenerys isn’t taking this lying down; The Unsullied are ready to rush Casterly Rock. We haven’t seen too much of Jaime yet this season, but it looks like he’ll be playing a bigger role in “The Queen’s Justice,” maybe even trying to regain his reputation of being one of the best fighters in Westeros. In the trailer for this episode, Jaime is seen behind a slew of archers, working to defend Casterly Rock against the onslaught of The Unsullied. Finally, the one thing weâ€™re looking forward to most is for Jon Snow and Daenerys to meet. 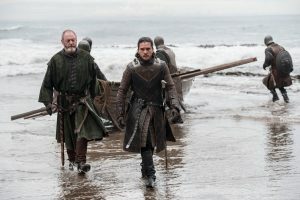 In the last episode, Jon Snow rode off with Davos to meet Daenerys in order to attempt to form some sort of diplomatic agreement. It seems like these two would be perfectly suited to help each other out, but we wonder what kind of tensions could arise with Daenerys demanding that Jon Snow bend the knee.